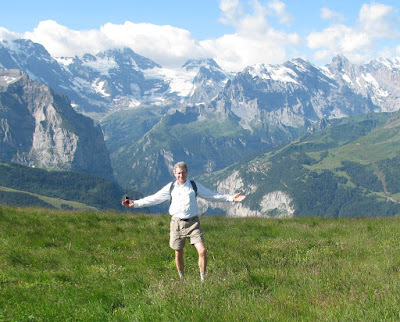 Our wonderful trip this summer took Rob and me from below sea level in the Netherlands to the "Top of Europe" - the Swiss Alps. We flew into Brussels, where we were met by my good friend, Tony deRijck. After a wonderful three days visiting with Tony and his wife Mimi at their home in Heldergem, Belgium, they drove us to Amsterdam where we joined our Viking River Boat cruise along the Rhine River from Amsterdam through Germany to Basel, Switzerland. Following the cruise, Rob and I headed off on our own to explore the best of Switzerland...two beautiful days in Luzern and a grand finale of four absolutely spectacular days in the Berner Oberland, the best of the Swiss Alps. Sitting in the Newark airport on our three hour layover en route from LAX to Brussels, my first thought was that all airports are so much the same…Hudson News stores with all the same paperbacks and magazines, restaurants, the gate areas filled with waiting passengers, people wandering around dragging suitcases. It all feels so familiar now and at first glance, I could be in any of a hundred American airports. But thinking more about it, I began to notice the slight differences…in Albuquerque and Phoenix, the gift shops have a definite Southwestern flair, with Native American crafts and jewelry for sale; in Hawaii, the lobbies are open to the gentle air and chocolate macadamia nuts and flowers fill the shops; and here in Newark, the servers in the Famiglia Pizzeria greet you with “How’r’ya doin’? Whadda’ya want on that…peppahs, gahlic, basil?” It’s fun…and I see Rob’s boyhood New Jersey accent getting stronger by the minute as he talks to the locals here. What a difference a bigger plane makes! Our flight from LAX to Newark was on a very crowded plane...only one aisle, and seats so tightly packed that poor Rob's knees were jammed up against the seat in front of him. But our flight from Newark to Brussels - on a nice wide-body jet - was only about half-full (a first for me…every other flight I have ever had to Europe has always been completely full). I grabbed the center row of seats next to Rob so we each had an entire row of seats in which we could actually stretch out and sleep, so even though this flight had individual screens and a choice of over 200 movies, I ate dinner and lay down to sleep. It was wonderful! I slept for a good four hours of the seven hour flight and arrived in Brussels at 7:45 a.m. feeling quite normal and rested. We zipped through customs very quickly and found Tony waiting for us at the exit. Tony and I first met exactly 40 years ago when we were both students at the University of Bergen, Norway. He and I have remained good friends ever since, and I have since had the pleasure of becoming friends with his wife, Mimi, and their daughter, Annemie, who came and lived with my family for a few weeks about 18 years ago. Before heading to Tony's village of Heldergem, we drove into the city for just a short visit to the Grote Markt, one of the best preserved medieval squares in Europe. Our little excursion turned out to be something of an adventure. We made our way through the narrow streets, which – as in most old European cities – are not necessarily at right angles but instead follow the lines of the old medieval hodge-podge of streets, to the Grote Markt (or Grand Place, depending on which part of the country you are from - Belgium's two languages are Flemish (Dutch) and French, and most places have two names). When I was here 10 years ago, we arrived on July 11, the Belgian “Independence Day,” as Tony explained, celebrating a battle won against the French in the early 1300’s. (Tony joked that they have to celebrate as it is the only battle they ever won.) On that visit, the square was filled with revelry, costumed people, clowns, balloons, music. Today, they were preparing for the party and the square was filled with machinery and equipment setting up the platforms, etc…so I have still never seen the square looking empty and regal…but the buildings are beautiful and impressive if I just looked up! We snapped a few photos under the grey skies (although happily with only a few sprinkles), had tea in a restaurant, but told Tony that we would really rather just go home than do much more exploring. Easier said than done! We had not marked our path through the city very well and had to “feel” our way back with some help from St. Michael and St. Gudula Cathedral, which we knew was near our parking building. We paid a short visit to the cathedral, and then with some help from a very friendly policeman, we found the car. Tony drove us the short 30 minute drive to Heldergem where we happily greeted Mimi and settled into our room with its lovely view of their large backyard and the gorgeous green countryside beyond. We showered and settled in while Mimi prepared a nice hearty meal…eggs, bacon, several cheeses, homemade rolls, fruit. We had a good visit, reminiscing about old times. Our plan for the afternoon was to go visit Annemie, Tony and Mimi’s daughter, but Rob – who had a cold and had not slept as well on the plane – really needed a nap. (He actually fell sound asleep in the living room while we were getting ready to go.) So we sent him upstairs for a nap and Tony, Mimi, and I went to visit Annemie at her lovely home about 5 km. away in the next village. It was a wonderful visit! She and I chatted like old friends and her children, Pauline, 8, and Simon, 3, were both very friendly and lively. Pauline and I managed to communicate very well in spite of the language barrier…she introduced me to her two goldfish, Flip and Flop, and she took a good photo of the rest of us, imitating the way I had taken photos by counting in English, “one, two, three”. As a good Belgian hostess, Annemie had naturally prepared a big tea of pastries and cream cake. Her new house is very nice, with huge windows on both corners of the living room looking out on green meadows, a pasture with horses…and a little robot lawnmower chugging busily around her back lawn. We returned to Tony’s house and collected Rob, then set out for the “Broad Meadow” castle in the little town of Zottegem. We had visited here on my first visit and I had loved it…a big ivy covered mansion with the most beautiful walking paths through the gardens and woods. We had hoped to eat dinner there, (and I hoped for a Belgian waffle), but the restaurant was closed so we ate at a fine little restaurant just across the street...a huge excellent sole for Rob and a steak for me. We were in bed by 10:30, and although in California it was only 1:30 in the afternoon, after such a long trip, we fell right to sleep and slept quite well! I was awakened from a sound sleep at 5:30 a.m. by the crow of Tony’s rooster. When I had spotted him from the window yesterday, I had thought him quite a handsome bird, but I had forgotten that roosters crow at sunrise! I dozed in between spells of crowing until about 6:30, then got up to shower and prepare for the day. Mimi once more prepared a wonderful huge breakfast…bacon, eggs, fresh juice, croissants, cheeses…Wow! After breakfast, we drove to the city of Ghent (or Gent…take your pick), which is a big modern city surrounding a large medieval center. We walked to the town square in front of St. Bavo Cathedral where a famous painting by the Van Eyck brothers, “The Adoration of the Lamb,” is found. There is a very good audio presentation, using individual headphones, that goes with it, which was very helpful at understanding the religious symbolism, as well as the artistic elements, that went into each of the panels on the large painting. It was quite beautiful…Tony and Mimi feel it is by far the most important painting in Belgium. When I came out of the cathedral, Rob was already outside, surrounded by a group of school children on some sort of group outing who had approached him to ask a question about the cathedral. It was very cute…he spoke to them in English and one little girl knew a little English and tried to ask her questions. He must look very friendly and approachable, as this same scenario was actually repeated by other groups of children a couple of more times. Tony went to the tourist office and arranged a guided tour of the city for us. We had a very good guide, but the tour took twice as long as it might have, as the guide repeated every single explanation in both French and English. I enjoyed seeing how much I could pick up in French (although it was much easier during the second half of the tour when he did the explanation first in English and then in French!). We first toured the large city hall…built in a variety of styles over several centuries, and visited the newer section where the civil courts had been held and then the gothic section where the criminal courts were held. ending the tour at the old Meat Market. We stopped for lunch in the town square (but still no Belgian waffle), then headed home. In the evening, Rob and I set out on a nice walk through the countryside. It was a real treat…we walked down to the end of Tony’s street where a brick path sets off through the trees, then right through the middle of the tall cornfields in the neighborhood. After a bit, we met up with a country road that turned back toward his village of Heldergem, walking past cows and horses. At 9:30 p.m., the sun was still hovering above the horizon and the whole setting was very peaceful and idyllic. Mr. Rooster woke me very early again. Rob and I both got up before Tony and Mimi and took an early walk through the cornfields. The weather was lovely and mild. After our usual big breakfast, we drove to Bruges (Brugge). What a gorgeous city it is! Less modern surroundings than Ghent, with a big green park surrounding the central area. The entire central part of the city still looks medieval (discounting the modern stores and the tourists, of course). When you look at eye level, you are looking at modern tourist shops filled with Belgian lace and chocolates, but when you look up, you are transported to the Middle Ages -a skyline filled with beautiful carved stone and the typical German step-roofs. and the “Holy Blood Chapel” in the corner. Tony said this is the older and more authentic city center. We continued on through a narrow passageway and found the canals that wind through the city and got on one of the boats that tour the canals. The guide repeated everything in Dutch, French, and English…but very quickly so it didn’t slow the tour down. Every turn brought new beautiful sights into view…we passed under the oldest bridge in Bruges…and the lowest…Tony and Rob barely fit underneath! We saw the almshouses that had been provided by the rich of the city for the poor, and private homes with flower filled patios overlooking the canals (very expensive). I was just snapping photos like mad, but we moved along so swiftly that there was no time to compose the shots, so they don't really capture the charms of the city. We ate lunch at an outdoor cafe in our best weather so far! We lingered a long time over lunch and conversation…a very European practice. As a visitor, I always find myself torn between rushing around to see everything and enjoying the more leisurely pace. I like the long conversations, but I never know if I will ever get back and want to see everything! The first cathedral contained an early Michelangelo sculpture of a Madonna and Child. It was one of his earlier works and was created for a church in Siena, but when the person who commissioned it could not pay, he sold it to a Bruges merchant. It was the only of his sculptures to leave Italy during his lifetime and is still one of the few of his works to be found outside Italy. The weather was turning cool and cloudy again, so we returned to Heldergem. After dinner, Tony took us on a new route through the charming countryside around his home. We followed a path behind the houses where many people had little backyard “farms”…big gardens filled with potatoes, onions, squash, cabbage, apple trees…and pens with geese, sheep, even a small herd of spotted deer. (I was mad at myself for not bringing my camera.) Naturally, Rob made friends with as many of the animals as possible. We saw the backyard of the home where Tony had grown up, then continued through the countryside (past two feral kittens who darted in front of us and disappeared into the thick underbrush) and out to the old mill, then crossed back through the back streets of Heldergem, past the old churchyard and cemetery to his home. Although it was after 10 p.m., it was still light, with a soft pink glow in the western sky. The back door opened out onto the little marina at the edge of a large lake. Rob opened the back door and was immediately greeted by a very eager duck who demanded some food, so we crumbled some sweet roll for her…she almost took off Rob’s fingers in her eagerness. Our first impressions of Amsterdam were not very positive, as the signs to the "centrum" took us right up the main thoroughfare of Damrak Street. It had become a sunny Saturday and the street was terribly crowded with a mass of very touristy shops, thousands of people, lots of litter. We continued up the street to Dam Square where we saw a monument to WWII veterans and the Royal Palace (where Queen Beatrix works but does not reside), then we turned off the main street and finally found our way to the famous and much more charming Amsterdam canals. and the thousands of bicycles parked everywhere. This city is designed beautifully for the bikes...there are bike paths lining all the major roads and the drivers are very respectful of the bikers. The bike parking lot in front of the Centraal Station gives some idea of the magnitude of this mode of transportation! We also passed a couple of the famous ‘Coffee Houses” from which the smell of marijuana drifted. The Rhine River Tour Begins! We woke to pouring rain, so Tony graciously consented to drive us all the way to Centraal Station where we would be close to the dock. Another mini-adventure! He was not familiar enough with the (very confusing) streets of Amsterdam and we drove around and around, trying to follow the pedestrian signs to the station…which often pointed us toward one way streets or streets blocked to traffic. Finally, after asking about four different times, we quite by accident found ourselves on the street directly behind the train station and realized that Tony could drive us right to our ship, rather than leaving us at Centraal Station. Our ship was docked right where it was supposed to be, so Tony and Mimi dropped us off in the light rain a short walk from the boat and we walked right on and were greeted very pleasantly. We were too early to get into our cabins, but there was a light lunch of open faced sandwiches and fruit available, so we ate and sat in the big lounge for awhile looking out at the rain. After an hour or so, Rob went out for a walk in the city in spite of the rain. (It is very hard for him to sit still for too long.) I wrote in my journal and read for awhile. When Rob returned, our cabin was ready, so we settled in. It felt so good not to be living out of a suitcase for awhile! The room was very nice…not large, but plenty big for us...and we had big French doors that opened to the fresh air and the view…very pleasant! The afternoon had become much sunnier, so we set out again into the city…this time avoiding the main street and working our way through Haarlem along the canals. Once again, we were struck by the number of bicycles…including many with child seats or even built-in carriers big enough to hold an infant’s seat or bassinet. I was also struck by the houses that were definitely not at right angles to the adjoining ones…in fact, many of them looked as if they would not have stayed upright, had it not been for the houses on either side holding them up! Haarlem was quite dotted with the "coffee houses," some very seedy looking and some very upscale, but of more interest to us were the wonderful cheese stores! We also noticed the signs on the mail boxes indicating with a yes or no whether or not you will accept junk mail...what a good idea! We really didn’t have a sense of where the important sites were, so we just wandered for a bit until it was time to return to the ship for dinner, where we enjoyed the company of our new acquaintences, Gary and Cynthia from Phoenix, and Eugene and Svetlana, a darling young couple originally from the Ukraine who now live in Chicago. We woke to sunshine…the first really sunny day of our stay so far! Rob woke earlier than I, so he went down to the lounge for coffee while I got dressed. He came back very pleased to have met Chuck, a retired professor of International Studies, with whom he had hit it off very well. Our city tour started at 8:30, so we went to an early breakfast…a lovely buffet with the “healthy table” filled with muesli, fruit, yogurt, etc…and the not-so-healthy, but yummy, hot food line, with sausages, bacon, eggs, rolls etc etc etc. As promised, our bus left at 8:30 on the dot and we proceeded to a nearby wharf to get on one of the little boats that tour the Amsterdam canals. and under a bridge into the canal system that criss-crosses the city. When we reached the flea market, she remarked that if your bicycle was stolen, it was no problem…you could buy it back (for twice as many Euro) here at the flea market a few days later. The Amsterdammers call this re-cycling! We floated past the grand houses of the Herren…the gentlemen…and the more modest quarters of the middle and lower classes. It was interesting to see the hoists jutting out from the roofs of many homes…the only way to get furniture up to the upper rooms from the ground, as the staircases are too narrow. then it was back to the bus for our trip through the paved streets of the city to the Van Gogh Museum. Because we were on a tour, we got to walk right in past the long line outside the building and were given individual headphones with a very good narrative of the major Van Gogh works on display. It was very well done…the narrative included “mood” music and quotes from Van Gogh’s letters to his brother Theo in which he discussed his own thoughts about the canvas that we were viewing at the time. The museum was set up in rooms that represented the different periods of his life and which reflected his evolution as an artist…the most striking thing was his movement from a very somber, dark style to a more colorful palette with influences from both Japanese art and the Impressionists. I recognized many of the paintings on display…although others of his best known works such as Starry Night must be housed elsewhere. But a couple of his self-portraits were there, one of his Iris paintings, one of his Sunflower paintings, and the Wheat Fields with Blackbirds. Rob and I both agreed that our favorite was a trio of paintings of fruit trees covered with pink and white blossoms…they just glowed. When we were finished touring the museum, I FINALLY got the Belgian waffle that had eluded me in Belgium, then we returned to the bus ON TIME and returned to the boat for lunch. As we were eating, we “set sail” for our cruise, leaving the Amsterdam Harbor and entering the Amsterdam – Rhine canal, a 45 mile canal leading us to an arm of the river. We would actually not join the main Rhine River until about midnight that night. At 3:00, Christiane presided (in Dutch costume) over a lecture on “Cheese and Jenever” (which is a Dutch liquor related to gin) in the lounge, reading a story about the elves of Cologne, and ending with a cheese tasting with Gouda, Edam, and Amsterdam Cheese…yummy! (I did NOT have the jenever - the only alcoholic drinks I enjoy are the ones that taste like fruit milkshakes!) The rest of the afternoon was just spent relaxing on the observation deck or watching the world go by from our nice window seat in our cabin. We went through the first of the several locks our ship would pass through as it traveled up the Rhine toward the higher elevations of Switzerland. At 6:30, I went to Christiane’s daily briefing on the next day’s activities, and then Rob joined me in the lounge for the Captain’s cocktail party. The captain greeted us and introduced his crew, and then we went to dinner. We joined Rob's new friend Chuck and his wife Debbie and a nice English couple, Gilbert and Bronwyn. It was a lively dinner…we could tell it had been a good discussion when we noticed that we were practically the last table of people left in the dining room. By this time, it was almost 9:00 so we headed off to bed. Rob was already awake and showered when I woke up around 7:30. I dressed and went down to join him at breakfast. It was a lovely warm sunny day. After breakfast, he went on deck to do some exercises…several laps around the deck…while I attended the German language lessons provided by two of the crew members. They were very cute, and we learned a few basic terms, but I can’t say that I can speak any German yet! Following the lesson, I went on deck to watch our progress down the Rhine. This part of Germany is quite industrial. Although much of the river was lined with meadows and farms …we saw a herd of horses and later some big bulls down by the water…we also saw big factories, huge piles of coal waiting to be shipped, modern bridges and towns…this was definitely not the fabled "Romantic Rhine," although it was still very pleasant to be floating along. After a nice German lunch of sausage and sauerkraut, we went on deck to view our arrival into Cologne. Cologne is the fourth largest city in Germany, and its famous cathedral, which dominated the skyline, is the largest Gothic cathedral in the world. We docked very near the cathedral and at 1:00 joined our tour guide, Arno, for our walking tour of the old part of the city and the cathedral. Our tour uses a wonderful new system for hearing the guide…we were each issued a set of headphones and a receiver keyed into his microphone, so we did not have to cluster around him to hear but could wander a little, shoot photos, etc. and still hear every word. and then visited St. Matthew’s Church. Because of extensive damage during the war, the monastery that used to surround the church has been replaced by modern apartments. Arno was not complimentary about the style of architecture built during the 50s and 60s, but at least the architects constructed the apartments on the foundations of the old monastery, so we can see where they would have stood. and we saw the touching carving of a war officer who is known for his interesting and sad love story. As a poor man, he was rejected the woman he loved, so he joined the military so he could become rich and famous and win her love. Well, he did become a great war hero, but he had the misfortune to have picked the beginning of the 30 Years War! So by the time he returned, covered with glory and medals, it was too late to continue the love affair. and then continued to the centerpiece of the city…the great Cathedral. Having a guide made it much more meaningful, as we learned many things we would have missed. The exterior is quite beautiful, but unfortunately so blackened by pollution that it is hard to appreciate all of the exquisite stone work. We were told that the cathedral took over 600 years to build…more on that in a minute…but that it will never be finished, because they are always working on some area of it to restore. The legend holds that if they ever actually finish, it will be the end of the world. Also notable were a few sections that were lovely new white sandstone…some of these were replacements for sections of the cathedral that were destroyed by bombs during the war, in spite of the admonitions of the allied generals to avoid hitting the cathedral. The cathedral was begun in the 12th century. Because it is believed to house the remains of the Three Wise Men in this very impressive reliquary, it was a major pilgrimage site. The choir was completed when the first great disaster postponed the construction…the Black Plague in the 1400’s. When the main episode had passed, construction continued and the primary nave was about half completed when the next big "disaster" hit…the preaching of Martin Luther, which convinced people to stop paying the indulgences, payments to the church for absolution of your sins, which had been used to pay for many of the great buildings of the Catholic church. When the payments slowed, so did the building. It continued slowly until the final big disaster…1492 and the discovery of the New World. Trading suddenly switched from the great rivers of Europe to cross-ocean trading, and the cities of the Rhine declined greatly. The cathedral stood partially completed and may have remained that way forever, except for the Romantic period of the 19th century when interest in and love for all things medieval created a movement to complete it, and with the more advanced techniques for building, it was finished relatively completely. Now, again, the main problem is just keeping the soft walls from eroding away and being eaten by pollution. There is a workshop at the base of the cathedral where work is constantly being done to maintain the building. Our tour ended at a brewery, where I did try one of the local beers. They serve it in this region in tall narrow glasses, instead of the steins of Bavaria. (Tourists have been known to ask, “Why do you serve your beer in test tubes?” – but they weren’t really that small.) I did not like the beer…quite bitter…but then I have never liked beer! The rest of our group, Chuck - Rob's new professor friend, and his wife Debbie, and Bronwyn and Gilbert, from England, seemed to like it just fine! After our tour, we had several hours of free time, so I went off to visit the Chocolate Museum! It is a very impressing building, but the tour was rather expensive, so I just paid a little visit to the gift shop. There were hundreds of very interesting flavors and varieties - from white to the darkest bitter and from fruit-filled to chili peppers - but I was quite good at resisting temptation and just got a couple of good pieces. That evening, the ship had two entertainers from Cologne who put on a little performance. I had expected some traditional German oom-pah music, so it was a surprise to discover that these were two rowdy guys who were here to educate us on the German tradition of Mardi Gras, which naturally involves much drinking and dancing. Chuck got called upon to help them with the entire evening, and led us all in the Conga line! Our darling ship's bartenders also got into the act. Today was the much anticipated cruise along the "Romantic Rhine," the stretch of river between Koblenz and Rudesheim renowned for its castles on almost every hill top. and where our first excursion of the day would begin. Rob supervised the captain as he docked our ship at Koblenz, then we had our usual good breakfast and got on our buses for a short drive up the hill to Marksburg Castle, the best preserved of the castles along the Rhine…one of the few that had never been destroyed. From the castle walls, we had some beautiful views of the Rhine Valley below. and the stables, which had on display the various instruments of torture used at various periods. Honestly, you might as well just confess to anything immediately, because if you didn’t, they would just keep it up until you did! We took the buses down the hill and waited in a pretty little park for our ship to pick us up then began our tour down the “Romantic Rhine,” the stretch of the river that is filled with the ruins and restored ruins of the many castles that dotted the hillsides of this region. Ehrenfels Castle, the last one before reaching our destination of Rudesheim. We also passed the infamous cliffs of the Loreley, with its statue of the long haired maiden who sang sailors to their doom as the passed the dangerous curve in the river at the base of the cliff. If you made it past the Loreley, the danger continued from the Seven Virgins, the cold-hearted maidens who were drowned in the river and turned to rocky reefs. Between the castles were many charming little villages nestled at the base of hills that were covered with the vineyards of the Rhine Valley, noted for its Riesling wines. and we visited with a nice pair of ladies, who were also taking lots of photos and relying on Rick Steves’ helpful descriptions of which castles stand at which kilometer markers. In the late afternoon, we docked at the charming little village of Rudesheim where we would spend the rest of the day. amazing calliopes, big-horned phonographs, player pianos, little snuff boxes with tiny birds that popped up when opened and sang in remarkably lifelike little voices. It was really quite an amazing tour! and looking at all the people sitting in the pretty little outdoor cafes, listening to the oom-pah music from some of the live bands in the cafes. through the large, shady town park along the waterfront and cleaned up for dinner. As always, dinner was preceded by Christiane's orientation for the next day's activities. Each night, she ended her presentation with a selection of story or poetry from German literature. Her tale tonight was about Max and Morris, two little boys who were so naughty they ended up being executed at the end of the book! No wonder the Germans can be so strict! Dinner was a wonderful experience…two new-to-us couples who were traveling together from Fairfax, Virginia - Karen and George and Charlie and Chris. Karen and George were delightful, and Charlie and Chris were so interesting. They work with Ambassadors for Christ International and train local people around the world to do mission work in their own regions. They have traveled extensively around the world, including South America, Myanmar, India, Pakistan…and were full of just fascinating stories. We all just talked and talked and the two hours went very quickly. I woke up to another gorgeous, warm, beautiful morning at 6:45 as Rob was returning from his morning “jog”…12 times around the observation deck. After breakfast, we docked at Mannheim where we would begin our excursion for the day to Heidelberg. We joined our bus and took the half hour trip from the more modern, industrial city of Mannheim (where Benz actually built the first motorized vehicle…a three-wheeled device that never “took off” but showed that it could be done.) to the old city of Heidelberg. I wish I could remember all of the stories that the guides tell us…Susan, our guide, was full of information but only certain stories stay with me. Heidelberg is a very old city and is, of course, renowned for its fine university, which has existed for many centuries. We drove immediately up the steep hill to the very impressive castle ruins at the top. The region was ruled by a variety of German kings, some of whom were memorialized in the sculptures on the façade of the main palace building…and judging by the statues, were good stout Germans. The only story I remember about them is the one about Fredrick V who had an arranged marriage with an English princess, Elizabeth Stuart…and when they met, it turned out to be a happy arrangement. They fell in love and had many children. For her birthday, he presented her with a beautiful portal into the palace…a gate that was put together from individual parts so it could be erected overnight as a birthday surprise. The castle ruins were large and impressive…I would love to have seen it in its heyday…but like so many old buildings in this region, it was completely burned and damaged by one of the many wars in the region, so it is just a shell of what it was. but Susan then pointed out the actual largest one…it is amazing - as big as a house! It was created because the people could pay part of their taxes with wine and it was all dumped into the barrel together…both good and bad wine. It was then used to provide wine for the castle servants. Susan joked that the servants lost out in two ways…bad wages and bad wine. Near the barrel stands a statue of Perkeo, the Italian court jester who doled out the servings of wine. (His name was the locals’ pun on his frequent comment. When they asked for some wine, he would respond “Por que non?” so they just shortened it. The story goes that he daily drank so much wine that on one fateful day, when someone handed him a glass of water instead, he drank it and died on the spot. After our castle tour, we took the bus back down the hill, past the large houses that house the fraternities of the University students, each with their own flag hanging outside. Susan then gave us a short walking tour of the old section of the town to the large cathedral which was surrounded by a marketplace selling hundreds of little souvenirs. When a tourist once asked her why they allowed the market to exist outside a holy site, she explained that the stalls were ancient and the church square was traditionally the site of the town markets since the middle ages. We have seen so many cathedrals on this trip that Christiane was joking about the ABC effect, "Another Bloody Cathedral." It is true that some are more impressive than others, but they each have their own charms. This one was very pretty, but the most distinctive feature of this cathedral were the very modern stained glass windows that were created after WWII. Rob and I ate the daily special (venison cutlets on schnitzel noodles, with a very good mushroom sauce) at a nice restaurant inside a pretty hotel across from the cathedral. The front of the hotel was notable because the façade had never been destroyed in the wars with the French, as this house had been owned by a Frenchman, so the front was quite distinctive. had a pastry from a local bakery, then separated to do a little more exploring on our own. It was quite hot (around 88 degrees), so I wandered slowly and tried to stay in the shade. I did make a special pilgrimage to the shop that sells the unique-to-Heidelberg “Lover’s Kiss,” a candy that was created as an acceptable way for a young man to show his affection for a young lady at a time when they would have been carefully chaperoned and monitored. It was really delicious!!! A nut praline patty surrounded by very good chocolate…I regretted not buying several, although it was probably good that I didn’t! and then returned to the park where our buses were waiting…after making a stop in the tourist office to use the restroom, after paying the mandatory 30 cents. Rob and I have been talking all during this trip about how well Europe does so many things…the new infrastructures, the frequent and fast trains, the universal health care, etc…but their "pay-to-pee" bathrooms are archaic. For goodness sakes, you HAVE to use the bathroom. It gets very frustrating to even find one sometimes, then you have to dig around for the right change…if you are lucky enough to have any. The women on this tour were very good about sharing coins for the bathroom. but once we got into town, it was very hot. We stopped for a few minutes at the Mount of Olives sculpture outside of the cathedral where Christiane gave us a little information about the history of the town and church. The cathedral…the largest Romanesque style cathedral in Germany dominates the village, but stands at the end of a large square and main street that have no trees or shade. The town was full of attractive buildings like the bright town hall and was very clean and nice, but it was too hot to sit and soak it in. then wandered the town together for a few minutes. I didn’t make it to the old Jewish section, which has never been restored since the war, but got a nice gelato and walked slowly back to the ship by myself. Rob and I cleaned up and rested for awhile. I went to Christiane’s daily orientation for the following day…today her little book was another book of children’s tales on what would happen to you if you were naughty…if you sucked your thumb, it would be cut off, etc. Quite gruesome! We sat again with Charlie, Chris, Karen, and George and had another very nice chat…this time more casual conversation about our travels. …they sang some songs for us - some in English, but also La Bamba, and some German songs. Very cute. And they had a raffle at which I won a prize, a pretty scarf. Another nice day! I woke when Rob returned early from his 6 a.m. morning jog around the upper deck due to the start of a storm. When I woke up upon his entrance, it was pouring rain outside and the wind was blowing so hard that the rain was streaming in great clouds sideways past our window. We were floating along very forested banks along the river, so it was quite dramatic! to watch the ship move through the first of the 10 locks we would pass through today. It was quite fascinating…we rose about 13 meters (40 feet) to rejoin the river upstream, but instead of a gate that rose above us as in the first lock on the first day of the cruise, this one lowered below us once the lock was filled with water. I visited the boat house where Alex, one of the ship's crew, gave us an explanation of all the instruments that pilot the ship. Our captain was actually using controls outside of the control house as we were in the lock. He has his son with him on this cruise…his first time to join his dad on a full cruise…and it has been sweet to see them together. Charlie, our new friend from dinner, also joined us on deck. At 10:30, two of the chefs gave a cooking demonstration on how to prepare Alsatian Flamekuchen, a kind of appetizer prepared with a pizza-like crust but with very diffmerent toppings. After the demonstration, we got to sample some and it was very good! They gave us the recipe so I will have to try it sometime. Then it was back to the cabin to watch the world go by and finish catching up in the journal and have some lunch. Oh, dear, another stressful day! At 2:00, we joined our excursion buses from Kehl to Strasbourg. Our guide, a pretty petite French woman named Regina, joined us and we first took a driving tour of the city. and their headquarters, a large circular building on which one side of the skyline was deliberately left unfinished to show that their work is never finished. There were a number of other buildings associated with the EU. We also passed a nice city park where we saw a huge storks' nest, complete with several storks in it. Regina told us that they were symbols of the city, and we did see a number of mementoes with the stork featured. But the highlight of Strasbourg is the old city center, spread out on a small island in the middle of the river that flows through the city. It is knows as Petit France. We walked with Regina over the pretty bridge and watchtowers that used to guard the entrance. Across from the bridge was a barrier across the water than one of the kings had built to protect the city. It could be used to close off the water access to the town. Just as we got to the other side of the bridge, it began to rain in earnest, so we all pulled on raincoats and pulled out umbrellas and tried to find areas under eaves of buildings or under the trees to listen to Regina. The old buildings along the river were very picturesque…half timber construction, with flower pots lining many of the windowsills. stopping under a wide bridge to look back at the little sheds that women had used for years to come down to the river to do laundry. It was an absolutely charming French village atmosphere, but was difficult to enjoy or appreciate to the fullest as the rain became heavier and heavier. We continued on to the large cathedral, Notre Dame, (like the one in Paris). Christiane joked again about our having to see the ABC, but I have to say, this was one of the best. It was a beautiful, huge nave, with the most gorgeous ornate organ hung high above us. One of the pulpits was one of the oldest original ones in existence, carved of sandstone. The altar area was lovely, with gold tile mosaics across the top and beautiful frescoes covering the entire back walls. The special jewel of the cathedral was its impressive astronomical clock. It was so huge, rising from floor all the way to the ceiling, that it was impossible to stand far enough away to get it all into a photo, but it had amazing details. The ages of man marched around with the hours. Apollo, below, points to the exact date. The planets that were known at the time of its creation circle the sun at the proper speed. The phases of its artificial moon mirror the changes of the real moon, and a chariot marches around to the hours of the day. In the same chamber was the “Pillar of Angels” which was also quite beautiful. while Rob took shelter under the eaves and talked yoga with another of our ship's passengers. We asked Christiane if this was normal weather, and she said that this was very unusual…just a bit of bad luck for our tour. We walked quite a distance back to our bus and returned to the ship to clean up for dinner. I went to the nightly briefing, where we had a little surprise…the water level of the river was so high from the rains that our ship could not navigate under the low bridges ahead, and we would have to be bused on Sunday from our last dock at Breisach to Basel. This actually worked out better for Rob and me, as the staff will deliver us directly to the train station in Basel. There were entertainers during dinner, a French man and woman who played the accordion and sang…very fun. Immediately after dinner, we went to a lecture by a local professor on the history of the European Union. It was very informative, but not very dynamic, so Rob and I both found ourselves nodding off, and we went to bed as soon as it was over. The last full day of the cruise! We woke to grey and overcast skies. It lightened a bit during breakfast so I had my hopes up for a sunny trip to the Black Forest, but alas, it was not to be. right next to our “sister ship”, the Viking Sun, and joined our buses at 8:30 on the dot. Our guide was a nice fellow from New Zealand who had married a German girl and moved here where he teaches English language. We drove through some pretty villages along the many corn fields and vineyards that dot the fields. It was still cloudy but not yet raining, so we had some good views of the lovely countryside. We learned about the region, and a bit of the history of the area…there were Neanderthals here, then Cro-Magnon. The Celts settled here, then were conquered by the advancing Romans, but the barbarians of the north kept the Romans from going any further, and…just as in Scotland…there are remnants of a wall the Romans built to keep out the fierce tribes. We stopped to visit a reputedly pretty church, St. Peter’s, up in the Black Forest, but the stop was a double disappointment. After holding off all morning, it started to rain hard the moment we got off the bus, and St. Peter’s was just starting services for a funeral so we couldn’t visit it at all. Rob and I shared a German pastry, and walked around the town for the short break. We got a kick out of the sign at this hotel welcoming bikers. Then we continued along through the dense forest. The rain was heavy and we were in thick clouds, so there was virtually no visibility at all. Our guide told us about some of the features of the houses up in the hills and all the preparations they made to tough it out during the long winters. Our second stop was at a little group of buildings, including a house where Marie Antoinette had actually stayed on her trip from Austria to France to become Louis 16th's queen. The mural on the wall of the building opposite the house says something along the lines of "Marie Antoinette slept here." and a cafeteria that had huge pieces of Black Forest Cake. Well, you can’t come to the Black Forest without having it, can you? So I shared a piece with Svetlana. It was pouring the entire time, so we just browsed in the shops until it was time to leave. (Naturally, the rain let up as soon as we got on the bus, although it did rain more on the way back.) Rob and I both dozed a bit as we drove back through Freibach to the boat where we cleaned up and went to lunch. and watching a large flock of wild swans on the French banks of the river opposite our ship. then the captain and crew came into the lounge for their farewell and toast. Rob and I had dinner with Cynthia and Gary, and Svetlana and Eugene and enjoyed a lively conversation. We talked and ate for a good two hours, then headed up to the cabin to finish packing and settle in for our last night onboard. I felt a little sad…everyone on board was beginning to seem very familiar and it was nice being so pampered. Tomorrow we would be on our own and off to new adventures. which crosses the Reuss River just as it leaves Lake Luzern to my left. and the old city wall and towers of the medieval city off to my right, the modern buildings of the modern city of Luzern directly across the river. Today was a wonderful day. We got up on the ship, had a light breakfast and finished packing. Right on schedule at 8 a.m., we said good bye to the Viking Helvetia and got on the bus that would take us on the final leg of our cruise to Basel, Switzerland. The rain had finally ended and the day was partly cloudy. The bus ride took just about an hour to the SBB, the Swiss railway station in Basel. The train trip was short and pleasant…just over an hour through pretty farmland. As we approached Luzern, I could see the Alps rising on the horizon. We got off the train, walked through the underground passage toward Altstadt, the old city, and emerged right at the opening of the old Chapel Bridge. Our hotel, the Des Alpes, lies right at the other end of the bridge! While we were eating, some of the many swans that live on Lake Luzern came looking for a handout...the swans were very tame and apparently well fed by the tourists here. (including a couple of charred ones that commemorate the fire that damaged the bridge in 1993). Then we went into the Jesuit Church, which we were afraid might be ABC, but which turned out to be a good decision! and an equally beautiful organ at the other. and then walked over the old Mill Bridge which is actually the original bridge from the 17th century! Like the Chapel Bridge, it has original paintings from the 17th century...and each of these contained at least one skeletal figure to remind all those who passed under it of their mortality. just in time to check in. From our fifth floor room, we had spectacular views in three directions of the city, the lake, and the mountains that circle the city. After cleaning up a bit, we had a good long two-hour nap, then the late afternoon was spent exploring along the lake waterfront, along the promenade in front of the grand hotels that had been established during the Victorian heyday of the region. The waterfront was lined with booths selling thousands of items: sunglasses, hats, scarves, jewelry, hookahs, etc. and very crowded. We turned up Lowenstrasse toward the Lowenplatz where we found the famous statue of the crying lion, a huge carving right in the wall of a large cliff. The lion was carved in memory of the Swiss guard of King Louis 16th of France who were killed or executed while defending the king during the French Revolution, and the motto carved above the statue says, "Helvetiorum fidei ac virtuti"..."To the loyalty and bravery of the Swiss." He does have a very sad face...it is a beautiful stone carving. We then walked along the long pedestrian street back toward the city wall and the Goldener Stern Restaurant where we were told we could find a good fish dinner. We went a little astray for awhile but soon realized our mistake (more of those angled medieval streets that wind around in unexpected curves and dead ends. We found nice seats outside and ordered our dinner, but then had to listen to the loud ringing of some very persistent church bells right across the street that went on for a good 15 minutes (because it was Sunday, said our waitress.) Rob’s fish and my pork cutlet were very tasty, and we lingered over dinner for awhile, and then came back to the hotel to check email and clean up. The Peruvian band on the corner by the train station was still hooting loudly and we were beginning to get very tired of it…their music carried through the air to our balcony very clearly! At 9:30, we went out again and joined a huge crowd down along the booths at the waterfront again. It turns out there is a big ten-day Festival, the Blue Balls Festival, going on, and thousands of young people were out, eating, drinking, and listening to the various bands that were playing rock music. I felt as if I had stepped back into the 60’s. Rock bands, love beads, the smell of incense, long haired hippie types walking around…lots of memories! We walked all the way to the end, then crossed the main bridge and visited more of the Festival on the other side of the lake in front of the Culture Center. Lots of international food booths and beer stands and more music. A wonderful day…one of the best! Another great day! We slept quite well in spite of the noise from the festival (although I did have to get up at 3 a.m. to shut the doors as the last revelers were on their way home). We went down to breakfast on the terrace here at Des Alpes. The breakfast was not equal to some of the amazing spreads we have had at some places on our travels, but it was a good choice of cereals, breads, cheeses, cold meats, fruit and yogurt, and the setting could not have been prettier. We were soon joined by the little sparrows that watch for any sign of a sucker…and they have Rob picked out immediately. Before long, he was feeding the bravest of them from his hand. I got a kick out of the one that perched on the eggshell of his soft boiled egg and ate right out of the egg! then sat in the shade in a waterside park for awhile. but when the conductor finally came around to take our tickets, he was “sorry to tell you, but you are sitting in first class and these are second class tickets.” Kicked out of the Ritz again! stopping now and then in little villages to take on or let off passengers. And surrounding us in all directions were the beautiful Alpine peaks. On the way back, I had a nice chat with a Swiss mom. I had been impressed that her husband had been teaching other languages to his little son. “My name is Raymond. I am five years old.” I do envy the Europeans their command of several languages. After the cruise, we stopped at the train station to buy our tickets to Lauterbrunnen for tomorrow, then stopped in the deli in Rail City (the huge shopping complex underneath the train station) to buy salads and sandwiches for our lunch, which we ate on our own balcony. Sitting there, looking out over the gorgeous views made me feel like the queen! After lunch, Rob did a little wandering on his own while I visited the Rosengart Collection of Modern Art. This was a very impressive museum! It had a find collection of Picasso, Cezanne, Modigliani,Renoir, and a whole floor of the artwork of Paul Klee, who was the first modern artist I ever came to appreciate as a child because of a little book my parents had of his very appealing and colorful paintings. No photographs were allowed, of course, but it was very worthwhile. When we returned to the hotel, Rob took a little rest while I went out to see a couple of sights I had missed, and just by chance came upon a group of men playing Alpine horns in front of the Jesuit Church. After enjoying the music for a few minutes, I made my way through the crowds at the waterfront booths again and went to the tall spired church off of Lowenstrasse which a woman at breakfast had told me was quite impressive inside. It was beautiful…gorgeous carved wooden doors on the outside and some very ornate gold altars inside. The organ was playing when I first walked in…always a treat! I walked home…by this time my feet were getting quite tired…and rested a bit before Rob and I set out together again, stopping first for a gelato, then on to the old city walls that rise up the hill past the old Mill Bridge. where we could visit the three towers that rise above the city. to the top and got some great views of the city and the surrounding countryside. There are some lovely houses in the hills behind the city wall…and we got a good view of the big white castle-like Hotel Gutsch on the hill opposite. By this time, I was really pooped, so we returned to the room for another nice rest, just sitting on the balcony, checking email, etc. Around 6, we walked back over past the train station and joined the enormous crowd at the Blue Balls Festival to get dinner at some of the many food booths set up around the square. Rob had a chicken curry and I had rosti, a traditional Swiss dish of hash browns topped with melted cheese. To tell the truth, I didn’t have much appetite…we have eaten plenty on this trip…so I ate about half of it. Then we wandered slowly home and packed our bags for our trip to Lauterbrunnen tomorrow. then finished up getting ready for our next leg of the journey. We had a little bit of “excitement” trying to check out of Des Alpes. The man in front of me had to try three different credit cards before finding one that worked. I assumed it was a problem with his cards, but when I tried to pay with my card, the machine also rejected it. Rob then offered his card which was also rejected, as were the next two he tried. Well, by now, it should have been clear to the receptionist that there was something wrong with her machine, but she said we had to go to the nearby ATM to get cash. No problem, except we were trying to catch a train to Interlaken and were now getting pressed for time! We rushed to the ATM, rushed back, paid, and then high-tailed it (as fast as possible with our heavy bags on our backs) to the train station. We arrived with a good two minutes to spare and settled into our seats. but I suppose it is silly to try to take photos from a train…just when you try to get a good shot, a tree or pole suddenly inserts itself right into the middle of your photo! We switched trains at Interlaken and had only 20 minutes into Lauterbrunnen. Our hotel was at the far end of the town from the train station, so it was a little hike with the backpack bags again…next time, I’m returning to my wheelie bag!! !...but the town is darling. Just one main street lined with hotels, restaurants, and shops, all with flowers in the windowsills and in pots along the street… geraniums, petunias, begonias…there is color everywhere. We checked into the Staubbach Hotel. and more snow-capped peaks of the Alps directly ahead of us at the end of the valley. The little village church (which does chime bells every quarter hour…we hoped they didn’t keep it up all night) is directly below us at the left. The whole scene was just idyllic. and the sound of cowbells tinkling on the cows in some of the meadows. The entire experience is just so SWISS...I know if I had been brought here blindfolded, I would have known I was in Switzerland the minute I saw the scene! We hiked for about 45 minutes then turned toward the other side of the valley to Trummelbach Falls. We were a bit surprised when we arrived to discover that there was a charge to enter, and Rob was a little indignant to discover that we had to pay "to look at a waterfall." However, the lady at the ticket booth very kindly gave us the Guest Card discount even though we had not received a Guest Card at our hotel, so we went in. The Trummelbach Falls are the only drainage of the snow melt from the glaciers of all three of the famous peaks on this side of the valley…the Jungfrau, the Monch, and the Eiger. It drains up to 20,000 liters of water per SECOND! We first had to take an elevator into the interior of the mountain where we then walked up to the highest of the 10 numbered cascades. It really is the most amazing sight. The water races violently through the narrow chutes. We climbed the very wet stairs through dark passageways up and up to each of the lookouts. The falls were illuminated so we could look up to see their entrance into each chamber and then down through the rocks. I suddenly realized that these must be the inspiration for the falls that run through Disneyland’s Matterhorn ride, but the power and noise of these falls was just awesome! What really amazes me is that this must be one of the natural wonders of the world, yet I never learned of them at all until I saw them in Rick Steves’ DVD of this area. where they reach the Trummelbach River, which is milky white with the granitic debris from the glaciers above and the grinding of the rock as the falls erode them slowly away. It was an amazing experience. My photos don’t capture the feeling at all, as the noise and the wet and the “feel” of the sheer power of the water were all part of the experience. before going out to dinner at the Hotel Oberland…another nice flower filled outdoor terrace. We ordered tap water, and then discovered when it arrived that there was even a charge for tap water! Rob sent it back, very politely, but the sweet waitress said, “It’s already here. Tonight there is no charge, but when you come back tomorrow, you will know there is a charge.” We thanked her and had a good dinner, a nice mixed salad with lots of vegetables. I had the bratwurst and rosti, a common Swiss dish of hash browned potatoes that comes with various toppings: melted cheese, egg, ham or bacon. Rob had a nice salmon fillet on a bed of spinach with a side of the rosti. We were pretty beat by the end of the day, so we headed off to bed early. To the top of the Schilthorn! Today was quite a special day. We got up around 7:00 and went down to the nice breakfast in our hotel. It is not a lavish spread, but a good selection of cereals, meats, cheeses, fruit, and yogurt…the usual Swiss selection. We had bought some hiking snacks at the little market the day before, so we added a couple of hard boiled eggs and pears from breakfast to use as our lunch and set off to conquer the Schilthorn. We walked about three miles through the same beautiful Alpine meadows we had walked yesterday here in the Lauterbrunnen Valley (Rob stopping to make friends with the animals along the way…he called to some cows and one of the calves actually walked over to him and started licking his hands. One of the things that impressed us the most about Switzerland was how clean and tidy everything was. There were flowers on the windowsills of most of the houses, twere no junky farm implements scattered around the barns, and even the woodpiles were stacked meticulously in field and farm. We finally came to the Stechelberg Schiltohornbahn, the series of gondolas that would take us up up up the mountain. Rising above the valley floor. Arriving in Gimmelwald for the first gondola change. Watching the valley floor fall further and further away. Arriving in Murren for the second gondola change. Heading toward the Schilthorn, our final destination. Arriving at Piz Gloria at the top of the Schilthorn. The restaurant at the top of the Schilthorn, Piz Gloria, was featured prominently in one of the old James Bond movies, "On Her Majesty's Secret Service." where I took more photos in every direction. After walking around the outside for awhile, we went into the theater at the base of the building to see the video that shows the scenes from the movie that were filmed in this region…the attack on the restaurant, as well as some exciting skiing sequences. and wandered around the pretty little town. Just as we were leaving town, we spotted Chuck and Debbie, the couple we had met on the cruise. They had told us that they would be staying in Murren for a couple of weeks, but we didn’t expect to actually find them. Along the way, we marveled at the parasailors who take off from the high cliffs above. There are a couple of companies that take tourists up for tandem jumps, and it must be beautiful...but I am afraid I wouldn't have the nerve. (We understand that base jumping off of the cliffs has also become very popular, but the locals are disapproving of their recklessness.) Just outside of town, Rob made friends with a beautiful cat who came up very willingly for a cuddle. Even here in this village, all the houses were covered with flowers and many of them had nice vegetable gardens. It is absolutely charming, but I can’t imagine what life is like on these mountain perches in the winter…beautiful, but very cold and very remote. we went through a lush forested area and finally reached a pretty stream on level ground. We both sat down to rest and thought, "Well, that wasn't so bad!" but when we started back along the trail, we discovered that we were still high above the valley floor and had about another mile of steep downhill before we reached the bottom! During this also very steep portion of our climb, it started to rain fairly heavily. We had made the rather unwise decision not to bring our rain gear, as we felt our warm jackets were more important on the top of the Schilthorn, but luckily, we were in a quite forested area during the rain, so it really wasn’t bad…and actually helped to keep us cool. After finally reaching the bottom, we still had the three mile hike back to Lauterbrunnen. We had left the hotel at 8:30 a.m. and got back at just after 3:30 in the afternoon. It was fantastic...but oh my goodness, were my legs and feet ever feeling it!!! We figure we walked about 12 miles altogether, and much of it was not easy hiking. But I loved every minute...so beautiful! Once we returned (with me trudging in about 15 minutes behind Rob), Rob showered and fell fast asleep...and I had a great bath in the huge deep bathtub in our hotel room...the first bathtub of the trip...and a great pleasure for my aching toes and legs! We had a quiet afternoon…checked email, wrote in the journal…then went to dinner back at the Oberland. We had the same waitress who immediately (but sweetly) reminded us that tonight we pay for drinks. We had already decided not to order any and told her no, thanks…and she showed up a few minutes later with our water and smilingly told us it was our treat. So nice! (She must agree with us that it is silly to charge for tap water!) We had a good dinner again. The mixed salad was even better than last night…loaded with corn, cabbage, various lettuces, tomato, etc. We did some reading in the evening, enjoying the changing light as the clouds drifted across the mountains, and went to bed early. and along the river at the bottom of the town. It was sprinkling on most of the walk, but that didn’t deter from my enjoyment. I came across a quartet of calves munching away and the one near the fence allowed me to pet her and even gave me a little lick with her plush, rough tongue. The smell of cut grass was very strong and it was all so pastoral and pretty. and also caught sight of a helicopter carrying loads to the villages high above us. Then it was back to the hotel where we enjoyed some more relaxation on the balcony with its beautiful views. We returned to the Hotel Oberland again (our third time) for another good dinner. The owner by now recognized us and welcomed us back. We had the great salad and split the Oberlander Rosti, the one with cheese and egg on it, and then we followed it with their wonderful apple strudel with custard sauce and delicious vanilla ice cream…very decadent! During dinner, the clouds moved in very low and dark and it started to lightning and thunder. As you can imagine, the thunder reverberated across the Alps with loud echoes…it was very dramatic and exciting. We walked back to the hotel in pouring rain and sat on the balcony listening to the thunder. Well, the best day of the trip was saved for last! After the glorious thunderstorm of last night, we awoke on this morning to really brilliant blue skies for the first time. 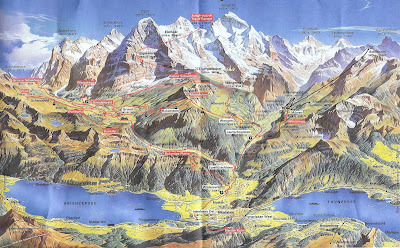 This map (taken off of our Staubbach placemats) shows the routes we took on Wednesday and today. You can follow the black lines to the right up to the Schilthorn, while today we took the gondola up to Mannlichen and then walked via Kleine Sheiddeg back down to Wengen. We had breakfast (and stashed away our pears and hard boiled eggs for our trek), then walked to the Lauterbrunnen train station to catch the cogwheel train up to the town of Wengen perched high on the ledge on the east side of the valley. Once again our timing was quite incredible…we had ONE minute to catch the train! The ride up only took about 15 minutes and gave us beautiful views of the Lauterbrunnen Valley. In Wengen, we walked to the gondola station where we were just in time to get on the gondola with a large group of Japanese tourists and their tour leader. The ride up to Mannlichen perched even higher above us was fun, with more spectacular views. from Interlaken around to the Lauterbrunnen Valley (with Murren and Gimmelwald perched on the hills on the far side) to the peaks of the Alps and down to Grindelwald, the large resort town that sits in the valley on the other side of the mountain range. The views of the Alps from here were just simply breathtaking. We had a clear view famous trip of three peaks, the Eiger, Monch, and Jungfrau, throughout the entire hike. The town of Wengen, now far below us, is well protected by the network of avalanche fences that have been built over much of this steep hillside. In fact, it was so inspiring that even Rob got in the act! and what I believe must be the most scenic playground in the world! And, yes, we saw eidelweiss...although I have to admit, not on this walk. They only grow in a particular area around here and I snapped this photo of a flower pot in Murren. and I took this series of photos to try to give some sense of the scope of the scenery. We could hear the cowbells clanging along below us, and several times came across the cows right next to the trail. They were quite used to tourists, and several of them allowed us to pet them. The bells are quite amazing, clanging constantly as the cows munch on the lush greass…you would think it would drive them crazy to have to hear the bells all the time, but they seemed quite unconcerned. Apparently, the bigger the cow, the bigger the bell! then continued down the trail into the little town where we finished our pears and eggs. Just after leaving the restaurant, we encountered a herd of goats (also with their little bells) crossing the road right in front of us! which was bursting with tourists taking the cogwheel train up the the very base of the Jungfrau. We also marveled at the mountain climbers who conquer the Eiger. but it was so gorgeous that I didn’t mind at all. In fact, I wouldn’t have wanted it to be shorter, as I was enjoying the scenery so much. We were quite close to the base of the Jungfrau and could clearly see the blue glacial ice on her flanks. and after the long walk, it was kind of nice to finally see the town of Wengen coming into sight below us. During the last stretch, we saw an interesting sight – an expanse of snow through which a little river had created a large cave through which to flow. The very last hour was quite steep and my toes and knees were beginning to really feel the strain, so it was nice to finally arrive in Wengen where we met the train to take us back to Lauterbrunnen. I have mentioned the neat woodpiles...In Wengen, we came across this one that is not only neat...it is actually decorative! Once again, it was wonderful to lie in our hotel room’s huge bathtub in a nice hot bath to sooth my aching feet. The afternoon was very low key…just resting and reading email…and doing the rather unhappy chore of packing our bags to prepare for the final leg of our trip. In the late afternoon, it began once again to pour buckets of rain. We walked to the Hotel Oberland (in the pouring rain) for our last dinner there then came back to finish packing. The Staubbach Waterfall is much fuller than at any time since we arrived, and it is fascinating to watch it. It pours off of the cliff above, but since the cliff juts out a bit and then slopes back, the waterfall does not cling to the cliff, but sprays outward where it is caught by the wind and billows out into a beautiful mist until it finally hits the cliffs below where it spreads out into a wider waterfall that cascades over the ridges. We woke around 7 a.m. and went down for our usual Staubbach breakfast…a bowl of cereal, hard-boiled egg (dyed red with a little white cross on it…the Swiss flag), and a croissant. We had packed last night so it was easy to just check out and walk down to the train station. Once again, we had incredible timing and immediately boarded our train and left for Geneva. It was a short trip to Interlaken where we transferred to the train to Bern, then in another hour or so, we transferred to our final train to Geneva. It was a very pleasant ride…the trains are so quiet and smooth. The countryside was not as dramatic as the ride to Interlaken, but it was very pretty and pastoral…small villages with green farmland between. The peaks of the Alps could be seen in the distance on the Interlaken to Bern section of the ride. After Bern, we very obviously passed into the French portion of Switzerland. Suddenly the signs were in French, rather than German. It was also interesting to sit on the train listening to the cacophony of voices around us…the very proper English group behind us, the mother and her cute little son chattering away in French, and the two tough teens in front of us speaking German. From Bern to Geneva was about two hours, but it went quickly and the views of Lake Geneva, which is quite large, were very pretty. We continued through the city and arrived at the Geneva Aeroport stop where it took us a few minutes to find our shuttle to the hotel…but once again, our timing was remarkable. We found the shuttle stop and there was the shuttle to the Holiday Inn Express sitting there just waiting for us! We arrived quickly at the hotel and happily could get into our room immediately. The room was simple but perfectly nice and could not be more convenient to the airport! The hotel also provided a transport ticket to use all public transportation in Geneva, so we used the shuttle to return to the city to do our last bit of sight-seeing. Geneva is a big busy city, but its setting on the lake makes it very pretty. We walked down to the park along the end of the lake, which was very crowded with tourists and locals enjoying the beautiful, and very warm, day (the warmest we have had on the whole trip!). The city was setting up booths for some sort of jazz music festival, so there was a lot of commotion. We had been commenting on the entire trip about the amazing number of watches being sold here...there were even watches for sale at the top of the Schilthorn! Well, on the way back to the train, Rob succumbed to temptation and bought a nice Swiss Military watch. We returned to the hotel where we had a quiet relaxing evening just reading and watching CNN while we waited for our flight home on Sunday. Each trip has its own special joys, but this one truly was one of the best...unmatched scenery, good company, a nice balance of busy and quiet time. But at the end of it all, it's always nice to come home, gather up all our "babies", and settle back into the real world.